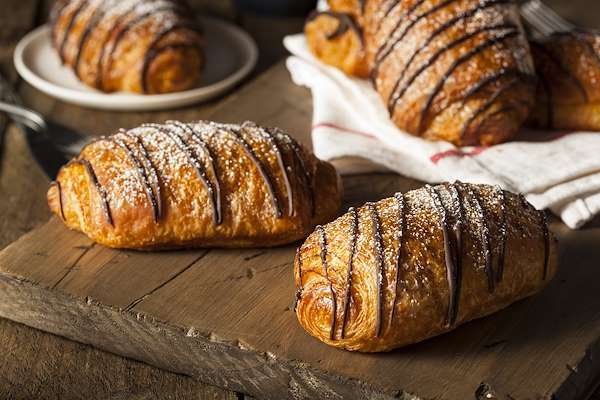 Let them eat…chocolate croissants! Marie Antoinette may have insisted that the masses eat cake, but she would have adored these sweet delicacies. When you serve your astonished guests these elegant crescents of chocolaty goodness, only you will know the secret! You make them with store-bought puff pastry, chunks of dark chocolate, and a sprinkling of sea salt. Bon appetite! RecipeSavants.com Let them eat…chocolate croissants! Marie Antoinette may have insisted that the masses eat cake, but she would have adored these sweet delicacies. When you serve your astonished guests these elegant crescents of chocolaty goodness, only you will know the secret! You make them with store-bought puff pastry, chunks of dark chocolate, and a sprinkling of sea salt. Bon appetite! Smart Recipes, American Recipes, Eggs,Grains Recipes, Recipes Eggs,Grains American Chocolate Croissants PT55M Serves 8 Ingredients: 14 Ounces Frozen All-Butter Puff Pastry 8 Ounces Dark Chocolate With 60 To 70% Cocoa 1 Large Egg 0.125 Teaspoon Fine Sea Salt 1 Cup Powdered Sugar Preheat oven to 425 degrees. On a floured surface, roll pastry into 1/4-inch thick sheet. Cut vertically to make four strips. Cut each strip into half horizontally to get 8 rectangles. Cut rectangles diagonally to make 16 triangles. Cut the chocolate bars into 12 pieces each. Position a triangle with wider end towards you. Place 1 piece of chocolate on the wider end. Roll triangle from wider end towards pointed end. Curl each end toward the center to form a croissant. Repeat with remaining triangles. Arrange croissants on a sheet pan.lined with silpat or parchment paper. Brush with egg and sprinkle with salt. Bake for 12 to 15 minutes until golden brown. Meanwhile, add water to saucepan and simmer on low heat. In a heatproof bowl, add remaining chocolate. Hold bowl over mouth of saucepan without touching water. Stir chocolate until melted and drizzle over croissants. Dust with powdered sugar.